An important feature of Ghanaian tertiary education is the foundational African Studies Programme which was initiated in the early 1960s. Unfortunately hardly any readers exist which bring together a body of knowledge on the themes, issues and debates which inform and animate research and teaching in African Studies particularly on the African continent. This becomes even more important when we consider the need for knowledge on Africa that is not Eurocentric or sensationalised, but driven from internal understandings of life and prospects in Africa. 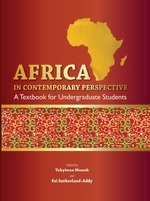 Dominant representations and perceptions of Africa usually depict a continent in crisis. Rather than buying into external representations of Africa, with its ?lacks? and aspirations for Western modernities, we insist that African scholars in particular should be in the forefront of promoting understanding of the pluri-lingual, overlapping, and dense reality of life and developments on the continent, to produce relevant and usable knowledge. Continuing and renewed interest in Africa?s resources, including the land mass, economy, minerals, visual arts and performance cultures, as well as bio-medical knowledge and products, by old and new geopolitical players, obliges African scholars to transcend disciplinary boundaries and to work with each other to advance knowledge and uses of those resources in the interests of Africa?s people.